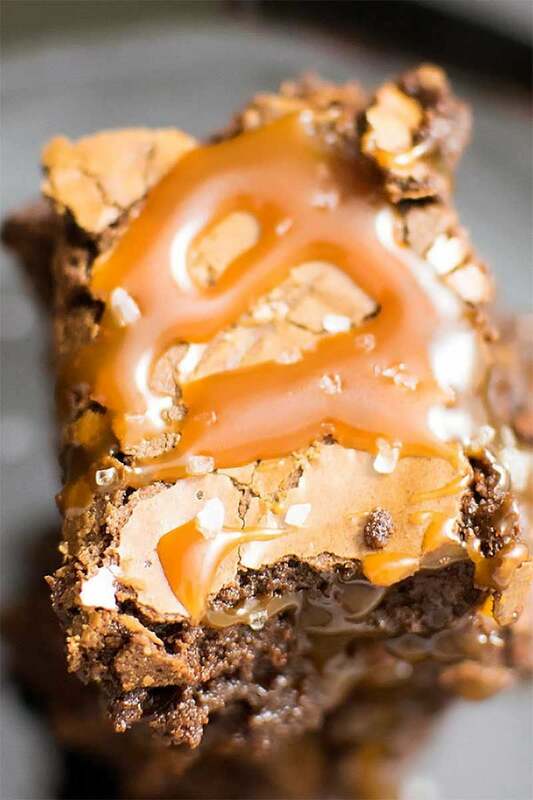 Give in to your sweet tooth with rich, chocolatey brownies that are baked & drizzled with a creamy caramel sauce and then topped with sea salt. Ever have one of those days where a nagging craving for chocolate just won’t leave you alone? This was the story of my life yesterday. I made the best chocolate recipe I know, which just happens to be ultimate brownies, one of the first recipes I featured on this site. But as I was working up the motivation to get off the couch and get to baking (I was in the middle of a House of Cards marathon, after all) I decided I wanted to do something a little bit different this time around. 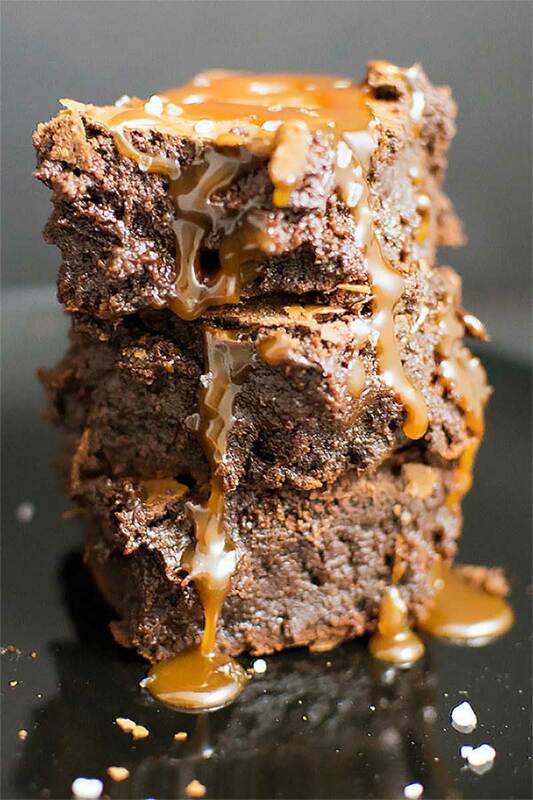 Because why make plain ol’ chocolate brownies when you can have something decadent like, say, salted caramel chocolate brownies? I’ve experimented with salted caramel sauce before (just to see what all the fuss was about – and wow, I should trust you guys more often!) but I never got around to trying it on some of my favorite desserts. I figured it was high time I corrected that. The salted caramel sauce is probably the trickiest part of this recipe, but even then it’s not too challenging – it just takes 15 minutes and a little bit of patience. 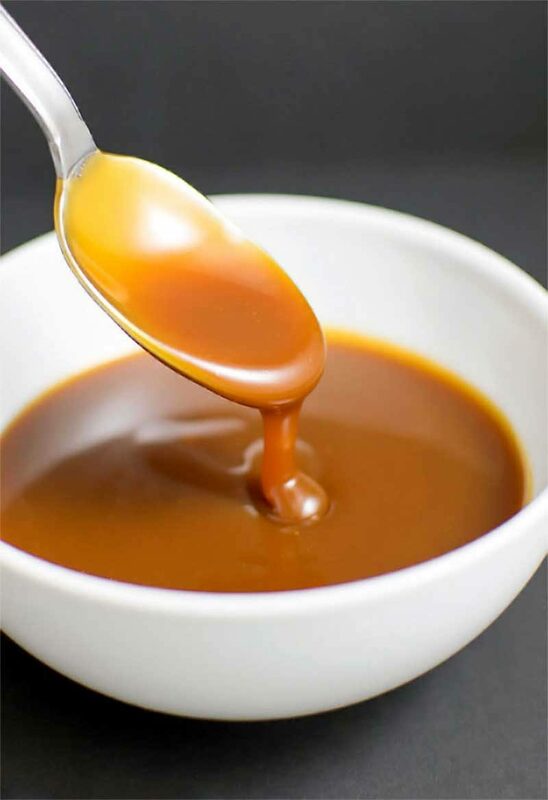 I tend to like my salted caramel sauce with a little more caramel than salt, but you can adjust the recipe to fit your tastes. And besides, you can always make up for any missing salty goodness by sprinkling some coarse sea salt on top. And as for how the brownies turned out? They were soft and moist and the caramel was perfectly gooey. 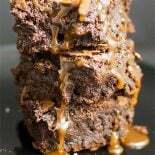 I had to make a few minor adjustments to the brownie recipe to help fortify it against the onslaught of caramel, but you’d never know the difference – they taste as good as the original recipe. Just with, you know, all that salted caramel to brighten the deal. What do you like to drizzle with salted caramel? In a medium saucepan, add the sugar and cook over medium-high heat for 5-7 minutes. Use a spatula to stir the sugar every 1 to 1 & 1/2 minutes, making sure to rotate sugar off the bottom of the pan. Cook until lumps in sugar dissolve and melted sugar turns a dark amber hue. Remove saucepan from heat and add in chopped butter. Mixture will bubble and boil - this is okay. Stir sugar and butter until completely melted and combined, about 2-3 minutes. Add cream and salt to saucepan, stir together, then return the saucepan to heat for 30 seconds, stirring constantly. Allow sauce to cool for at least 15 minutes. Sauce can also be stored in the refrigerator and warmed up when ready to use. Add the semi sweet chocolate chips and butter to a microwave safe bowl. Heat bowl in the microwave for 1 minute, then stir. Continue to heat & stir in 30 second increments until chocolate is smooth. Be careful not to burn chocolate. Let chocolate cool for 10 minutes. While chocolate cools, add 3 eggs, 1 egg yolk, and sugar to a large mixing bowl. Beat with an hand mixer on medium high speed for 3 minutes until mixture is light and thick (like runny frosting). Add the vanilla and beat for another 30 seconds. Dropping mixer speed to low, slowly blend in flour, salt, cocoa, and then cooled chocolate. Continue to beat on low until mixture becomes a little thick, roughly 3 minutes. Pour a little less than half of the brownie mix in the prepared 8x8 baking dish and smooth out with a spatula. Next, use the spatula to spoon out more brownie mix and press it up against the walls of the baking dish about a 1/2 deep, creating a pool in the center of the batter. Pour 1/2 of the caramel sauce in the middle of the brownie batter, stopping when the caramel reaches the top of the ledge you created around the sides. Starting at the corners, pour the remaining of the brownie mix on top, using your spatula to spread it evenly so the caramel sauce is mostly covered. Place in the oven and cook for 38-40 minutes. The top of the brownie should have delicate cracks across the surface in done. If using a tester, test in an area near the sides. Place brownies (still in baking dish) on a wire cooling rack to cool for at least one hour. When ready to serve, use the aluminum foil to lift brownies out of the baking dish, then peel aluminum away from the sides of the brownie. Cut into pieces and serve garnish with more caramel sauce and sprinkled with course sea salt. This post is giving me a serious craving for some gooey chocolate brownies! I would love to drizzle salted caramel to simple, plain vanilla ice cream. These look amazing!! Will have to try the recipe out. Wow! Just Wow!! Those look so delicious! I need to make these ASAP! Thanks for sharing! You had me at caramel! I LOVE caramel in desserts….it can turn an ordinary dessert extraordinary! Great job! I completely agree! This one turned out awesome, too 😀 Thanks! i just made them and tried to do a double batch! It is absolutely delicious taste wise but the consistancy was a little off and I am tryin to figure out what I did wrong. When doubling is there something I have to adjust specifically other then doubling the amounts? The caramel was too liquidy but I added a layer of prezels on the bottom that I think absorbed most of it! I definetily want to try it again! Thank you! Oh also it doesnt say when to add the coco powder so I just added it in the flour mixture! Thank you for letting me know about the cocoa! I’ve added that in – you were right, it goes in with the flour. I can’t think of anything you would need to change when doubling the recipe, although you may need to be extra careful when measuring the flour (there’s some good info on that here: http://www.mybakingaddiction.com/how-to-measure-flour/). As for the caramel, you could try letting it cool for a bit longer so it firms up more – it might help keep the caramel from being absorbed while the brownies bake. When I made these the center of the brownies were soft and gooey, but still pretty “contained” and not drippy. I used the remaining caramel sauce to drizzle on top & around when they were done. I love the idea of the pretzels! I’ll admit I haven’t cooked much with pretzels, but maybe they could be layered on top? That would keep the pretzels crisp and maybe help with the brownie consistency. I am beyond words when I saw this dessert! Totally scrumptious! What a perfectly yummy brownie. I’ve pinned it so I can make them later!! Tried this recipe today and they are DELICIOUS!! I can’t explain how gooey and rich they are and I’m sure my maths class will appreciate them tomorrow!! Absolutely FABULOUS!!!! Thank you so much!! Thanks for writing in Lizzie! I’m SO glad they turned out so good 😀 Hopefully your class will love them just as much! How much heavy whipping cream is needed? For some reason it won’t show me the number for it. Hey Emily! It should be 1/2 cup heavy whipping cream. I couldn’t get the caramel sauce right unfortunately but the brownie part was incredible! Sorry to hear about the caramel sauce, Keri! I’d be lying if I said that hasn’t happened to me a few times, too – it can be a little temperamental. I’m glad the brownies were still good, though!